Neil Pryde’s Hi Fi (HKG) held off several strong challenges from two TP52s for the IRC Overall win in the 2010 Rolex China Sea Race. This was after the boat clinched the Line Honours win yesterday morning. 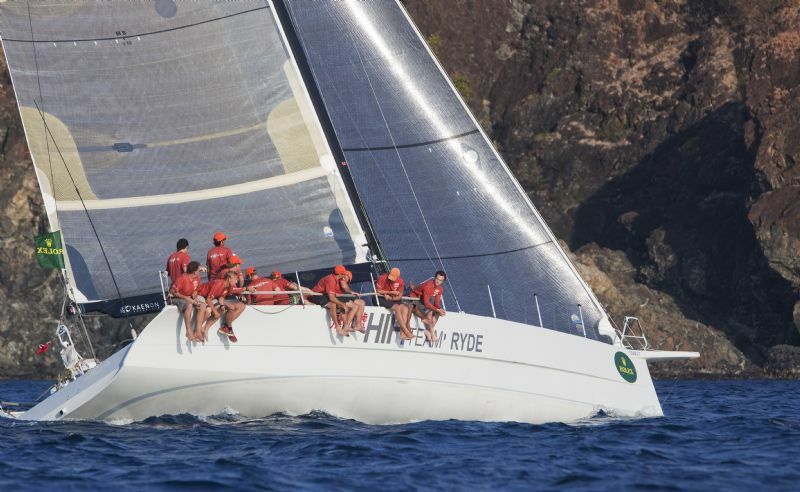 Hi Fi, which also took IRC Racing A division, held off rival Ray Roberts’ Evolution Racing by less than two hours. Roberts said that Evolution ‘parked up’ two times on the first night and lost about 12 miles to Hi Fi. For the rest of the way down the track the boats would close up and then spread apart again. Several hours behind Evolution, and keeping the pressure on all the way, was Geoff Hill’s Strewth (AUS), which was 3rd overall. Pryde was presented with a Rolex Yacht-Master timepiece for his IRC Overall win, which he generously handed over to Hi Fi crew member Kevin Costin (Kos), who has managed Pryde’s racing programme for the past 13 years. Ernest Echauz’ Subic Centennial (PHI) won IRC Racing B division, holding off a strong challenge from the Mills 41 Ambush. Echauz sailed as navigator this year, with Vince Perez as skipper. While Subic is the only Philippine entry in the race, Echauz is not just a local favourite, but also highly respected among other competitors for his efforts promoting youth sailing as President of the Philippine Sailing Association. Echauz always includes young sailors in his crew for both offshore races and around the buoys, providing them with some great training under the coaching of Australian Jamie Wilmot. In IRC Racing C, it was Anthony Root’s Red Kite II that prevailed. Talking about the 2009 San Fernando Race (the boat won IRC Racing), Root said, “Last year we beat our bodies, this year we beat our brains – this was a very tactical race. Dockside the morning after a middle-of-the-night finish, Nicholas Mittendorf, a crewman on board, talked about how Australian Maid came out on top, and said “The back end had a strategy of what to do, but always the weather makes various changes and you’ve got to adjust your strategy. Everyone is a mixture on the crew (friends from Darwin, other parts of Australia, the Netherlands) and everyone came together and sailed well. The owner really enjoys these passage races. “The race itself presented a number of challenges, we tore the mainsail and had to repair it at sea, and the steering chain split pin broke, and that blew things apart for a short period of time. So that put us behind, and a little bit on edge about our position in our division. But our plan was just keeping on working hard and doing all the right things we could do and keeping the pressure on, and staying in the areas where the wind was worked, and we managed to come out ahead in our division. In the IRC Cruising division, at press time, only one boat -- Skipper CP Wong’s Tipsy Frenz (HKG)-- had finished, so that class winner has yet to be determined. Dream and Baringo have retired and are motoring to Subic Bay. Eleven boats are still racing with most due to finish through the night; the time limit and cut-off provision for the race is 1200 hrs, Tuesday 6 April 2010. An informal dockside presentation took place tonight at the Subic Bay Yacht Club for the 1st – 3rd place finishers, in each division. The official Rolex China Sea Race prizegiving will be held on Wednesday 14 April at the Royal Hong Kong Yacht Club branch at Kellet Island, Hong Kong. This year is the 25th edition of the Rolex China Sea Race, which was first run in 1962, and has been held every two years since then. The 565 nautical mile race runs from the start in Victoria Harbour, Hong Kong to Subic Bay, Philippines. In 1972, it was officially recognised by the Royal Ocean Racing Club, and is now run under their prescriptions. The race has continued to attract increased interest and serves to draw the international yachting fraternity to Hong Kong and Southeast Asia.